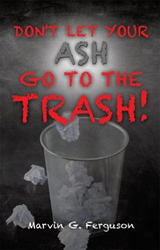 Marvin G. Ferguson’s new book, Don't Let Your Ash Go To The Trash!, ($10.99, paperback, 9781498466233) describes his childhood as “comfortably numb” and tells of his struggles to find himself as he searched for meaning and a true relationship with God. His story from birth to adulthood is one that will keep readers glued to the pages of this book – praying for Ferguson to find peace and happiness in his life with every page that gets turned. Unfortunately, the abandonment and neglect from both parents were a continued challenge that he faced throughout his childhood and into his early adult life. He was treated like a ping pong ball, sent back and forth from one state to another – to live with his mother, father and even lived with his older brother at times. Ferguson also had to find work at a young age – juggling work and school – to financially fend for himself. It was the furthest from a storybook childhood. Marvin G. Ferguson’s lonely, sad and dysfunctional upbringing led him into a 26-year marriage that ultimately ended in divorce – but happily gave him 2 beautiful children to love. Although he hit rock bottom after his marriage ended, when he reached out for help and turned to God for answers, his life improved. Through Ferguson’s story, readers will see how God wants to impart wisdom so each person can find effective healing for his or her mental wounds. His story is powerful, emotional and inspiring. Xulon Press, a division of Salem Media Group, is the world’s largest Christian self-publisher, with more than 15,000 titles published to date. Retailers may order Don't Let Your Ash Go To The Trash! through Ingram Book Company and/or Spring Arbor Book Distributors. The book is available online through xulonpress.com/bookstore, amazon.com, and barnesandnoble.com.